Most people with any interest in poodles already know that all sizes of poodles come from one source – the Standard Poodle. The Miniature, the Toy, the Teacup, and every other size imaginable are all descended from these original sporting water dogs of Germany. The “Puddle” as it was once known, was a medium to large dog in height, light weight, and extremely athletic. The breed was developed to retrieve waterfowl from very cold water, the long, hanging, “cords” of hair enabling the dog to shed water more efficiently, drying off much more quickly than their flat coated cousins. This breed of dog, now so cherished as a companion animal, and thought of by many as being ethereal and “foo foo”, was actually a dog that only very “manly” men would own, as poodles were the best at retrieving in icy cold temperatures. Temperatures that many sportsman didn’t want to deal with. Eventually, because of the dog’s jovial nature and good temperament with children, the sporting poodle became a popular house dog. The breed eventually found it’s way to England, and the British, fascinated by the dog’s personality and potential, started getting a little carried away with the clippers. (In my humble opinion). The “French Poodle” is actually a myth, it was Germany that developed the Poodle as a sporting dog and Germany, then England, and then the United States, that started breeding the dog for companion status. This is why, although you can certainly turn a perfectly good poodle into an ethereal, “foo foo” creature, they certainly don’t start out that way at birth. These are tough, smart, and loyal dogs with a great sporting history. Toy, Miniature, or Standard, the poodle will give any burglar a run for his money. And, don’t try to mess with a poodle’s human children, they will protect them with their life, if necessary. The poodle is one of the most human-oriented breeds of dog available. They love their family. The poodle is a very lively dog, another reason that breeding them smaller was popular! They are very smart and easily trained. They are usually very good at adapting themselves to any situation. High rise condo, cattle ranch in the boondocks, or suburbia, when with their family, they are happy. However, being as people oriented as they are, poodles don’t do well as “home alone” pets. They are not good “outside dogs”. They are only happy when occupied by the presence of their owner and can be very unhappy, noisy, and/or destructive when bored. They need a job, be it keeping the owner company or helping raise a houseful of children, they need to be kept busy. Physically, the poodle, any size, should convey a sense of pride and intelligence. The body of the poodle, according to AKC standards, should be as long from the top of the shoulder to the base of the tail as it is from the top of the shoulder to the ground. This gives the dog a “square” appearance when viewed from the side. A good poodle should be accepting of strangers, not aggressive, defensive, or timid. Poodles come in all sizes and colors, but only certain sizes and colors are accepted as “desirable” by AKC standards. Although poodles have been maligned as haughty, snobbish, prissy, fragile, and delicate, you can bet if you find one as so, it was the owner that created their pet in the owner’s image, as poodles are not normally any of the above. Our poodles at Rocky Mountain Rawhide are tough, yet sweet, lively, yet easily trained, affectionate without being over demanding, and loyal to a fault. They are the perfect companion dog. Powder Valley Poodles has produced dozens and dozens of service dogs for the disabled community. Focused, loyal, healthy and easily trained — our standard poodles are an excellent choice for people wanting a good, reliable and quick-learning canine for service work. But, there is one thing that most standard poodles lack that is sometimes necessary in a service dog — heft — weight — substance. In other words — they are just not big and heavy enough to get some jobs done. Pulling a full grown person in a wheelchair, helping a large person to get out of bed, up or down a flight of stairs or in and out of a chair or couch. The vast majority of standard poodles are simply not big enough to get the job done. Enter the golden retriever. Our standard poodles, when combined with the golden retriever’s sweet nature, retrieving instincts — and most importantly — their sheer bigger size and weight — combine to make a perfect non-shedding candidate for service work and companions for people with social anxiety. 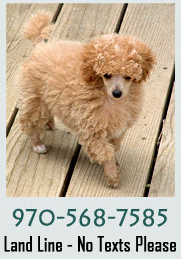 Powder Valley Poodles is proud to offer both poodles AND goldendoodles in all sizes in order to fulfill the needs of the disabled community, families looking for the perfect non-shedding companion and for people needing that perfect canine buffer against the overwhelming stress of a life filled with anxiety, depression or fear. Our poodles and goldendoodles are the perfect companion, best friend, therapist and monster repellent. They are healthy, friendly, focused and willing. They are the perfect family dog, therapy dog, child’s playmate and companion. You will not find a better dog than what is offered at Powder Valley Poodles. We guarantee it.